Created by Keith Kilburn with Art by Daniel Falconer. A Quote: (Said in a whining voice) But I wanted to go into Anchorhead and pick up some power converters! Frank is the son of Harry the Jawas Uncle M'ar-lone. The two cousins were always like brothers growing up and when Harry left for the stars Frank was lost without him...For about three minutes. M'ar-lone put Frank in charge of sorting drop parts in the sand crawler and Frank thought of it as a promotion. In his mind he was only a few years from inheriting the family droid business and hitting the big time. It all went to Bantha Poo-doo when Harry, after being gone for years, showed up with a freighter and took Frank and M'ar-lone (along with the rest of the clan) for a joyride around the galaxy. Frank ended up getting ship-sick from the experience and his father ended up being so impressed with Harry and his exploits that he sold the family droid business to him instead of Frank. Frank ended up getting promoted to vice-president in charge of ordering scrap metal, a prestigious position in Droids-R-Us. When Harry and Boggins, who Frank always referred to as 'the cursed one!' 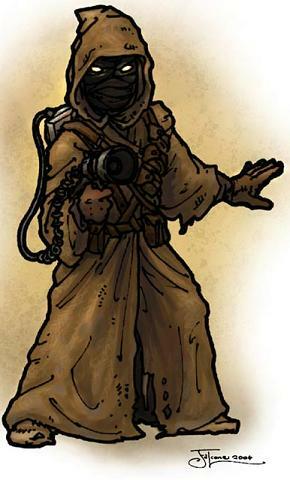 in Tusken, opened Jawa Inc. Frank was promoted once more to the lofty position of 'Head Strategic Coordinator for the Repair and Acquisitions Department' (or the H.S.C. of the R.A.D.) where he has remained for the last nineteen years. If he can hold out for another five years he's gonna get a gold chronometer and Bantha roast when he retires.